VOTE DOG, and June Patreon Rewards! I've got a couple more special one-off comics for you while I'm hard at work on the next big Sam and Fuzzy chapter. (Which should kick off next week!) Today's is one of the new comics I wrote for VOTE DOG. It stars Dobot, who appears in a few of the exclusive new comics in the book. Dobot was built by head Ninja Mafioso mechanic Edison, based on repurposed Buddy Bot tech. I created a few new animal characters for VOTE DOG! 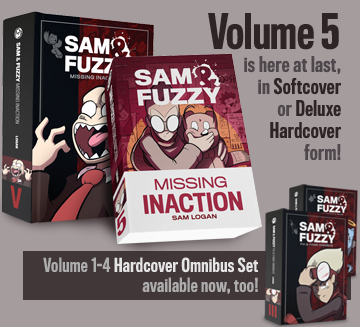 And like all the existing ones, they all wound up connecting to the Sam and Fuzzy universe in some way or another, because... well, I guess because I don't know how to stop myself! At this point, the VOTE DOG Kickstarter is getting pretty close to our funding goal! But it's gonna take a little more to get us there, and give us a shot at adding some stretch goal bonuses to the book before the campaign ends. So if you're interested in seeing this book get made, we could really use your support... be it by backing, or by helping spread the word to other dog-loving folks who might enjoy it! In other news... I haven't talked about Patreon much lately with all the Kickstarter hullabaloo, but I'm still busy making all the usual bonuses over there! 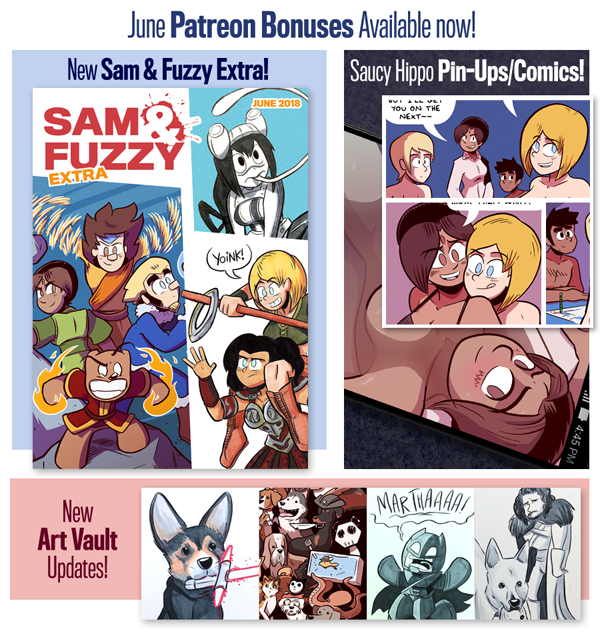 All our June Patreon rewards are now available: there's a bunch of fun new bonuses for Extra and Art Vault backers, and a quartet of new (nsfw) pin-ups and comics for Saucy Hippo folks. If you're interested, you can learn more about it on my Patreon page! We return on Wendesday with our next comic. See you then! When I decided to do a story like that about Conscience Cat, I realized pretty early on that the character he really needed to talk to -- that would really connect with his struggles -- was Carlyle. But I needed Carlyle to be a character that could actually open up and convey some emotion. I needed Carlyle to be on screen! How could I do that, when part of the appeal of Carlyle is that you never see Carlyle... that Carlyle could be anyone? Well, the more I thought about it, the more I really wanted to write this story! So in the end, I decided that we'd meet a Carlyle... one possibility of what I think Carlyle could be. And afterwords, we'd learn that the Carlyles were a family, and that more than one generation of Carlyle had worked at X-Per-S taxi. (Sometimes simultaneously.) I decided that, while I'd write Kat Carlyle exactly like I'd write any Carlyle, I wouldn't confirm whether or not she was the one in any of the character's previous appearances. I have my own personal headcanon, but I'm keeping it to myself. I think if you scour every Carlyle comic for details about the charater's age and work history, there's plenty of fodder for theories and timelines, but also lots of room for interpretation. (This is one of those special sorts of mysteries that only works in a medium with no voice acting, which I love!) So ultimately, I leave it up to you to decide! Anyhow, I hope you all enjoyed this story! It was maybe a bit of a narrative risk, but I think it was worth it, and I'm really happy with how it turned out. The Carlyle family dynamic let me show a more personal side of the character without dispelling too much of the Carlyle mystique. It also let me shine a little light onto what might make a character like Carlyle grow up to become, well... Carlyle. And last but not least, it let me end on a great joke. "Has Carlyle ever been seen outside of his taxi? I don't know that I'd recognize him! This question came in before Carlyle got out of the cab, but I thought it would be best to save it until the end of the story. The truth is, lots have people have seen Carlyle! Fuzzy, Ackerman, Lance, various Ninja Mafiosos. Just not Sam. Never Sam. Or at least, if he did, he didn't realize it was happening. Poor guy! Haha! Well I guess I'd say the same thing now that I did way back then... that I reserve the right to bring the character back if I think of some particularly great or vital use for them! But as a general rule, I do feel like Carlyle is a character that is best used sparingly. And I think Carlyle said everything that needed to be said to Sam in particular in those original appearances. I'll leave it at that! Our current story wraps up on Friday! Be here for it. 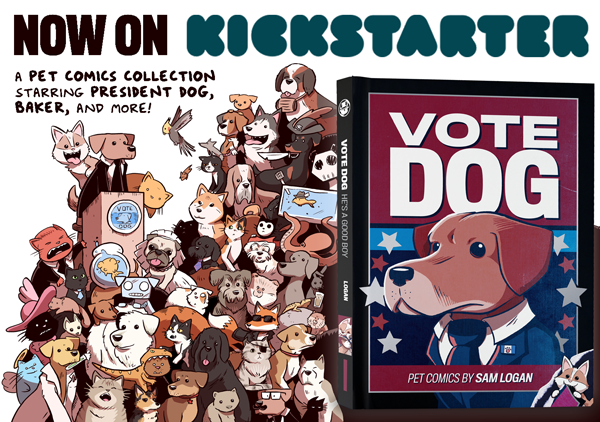 And as of today, we're also hitting the halfway mark for the VOTE DOG Kickstarter campaign! We're getting close to the goal, but we still need some help to get there. 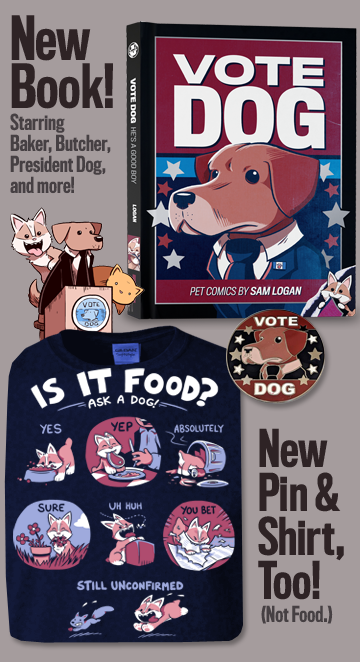 So if you want to see all my Baker, President Dog, and all my other critter-based comics get a print collection -- or know anyone else who would -- be sure to check the campaign out. Also! 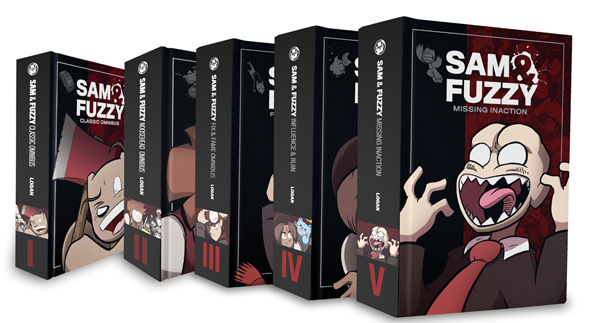 Something I may have not conveyed sufficiently is that the campaign is also a great chance to get some of our Sam and Fuzzy hardcovers for a bit of a discount, if you've been holding off on those! The Librarian tier, which also includes a swanky Artist Edition VOTE DOG, includes the three most recent S&F hardcovers for $20 off their usual price, plus reduced shipping. And the Completionist tier includes all 5 for $40 off! You can also get any of the specific individual S&F softcovers or hardcovers as add-ons, if you only need certain ones. Check on the campaign page for more info!